Christmas time is my favorite time of the year! One of my favorite parts about it is having a tree. I always have to have a real green pine tree as big as I can fit with my ceiling! Its a tradition that has been in my moms home and one I carry on to my own home. The smell of the tree when you come home from shopping or when you wake up and come into the living room is awesome. Ornaments are the key to a wonderful tree. I am the type of person who like a tree filled with different ornaments and each of them have a story to them. I dislike the display types of trees that all match and look perfect. They are great for departments stores and some people like them but for me I need my tree to be unique! Since my son has been born we have been getting ornaments that we can put pictures in and ones to make his hand prints. I am always looking for whats new and unique with ornaments and Snapily has a 3-D and Animated Ornaments that look really cool. 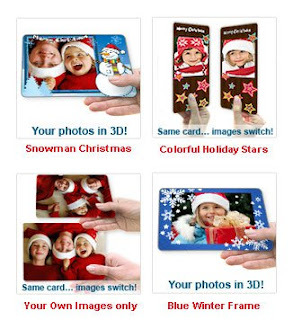 Your favorite photos are personalized on your choice of either a 3D or animated Snapily ornament. Hung with a high quality ribbon, the ornaments slight movements will show off images of your loved ones in 3D depth OR flip Animation. Snapily's flip animation allows you to view 2 images in a single space, so the ornament will rotate to reveal both of these photos - for a doubly great experience! Simply upload your images to create a personalized ornament that can be used for the tree, as a stocking stuffer and gift tag, AND an alternate for the traditional holiday card. In addition to ornaments, Snapily offers greeting cards, photo cards, business cards, notebooks, backpack tags, and much more! You can find out more and often find coupon codes and sales info from Snapily on their facebook and twitter accounts. *This is a sponsored post brought to you by Snapily.com and all personal opinions are my own.